Today my sister helped me fill and plant flowers in four big "honey bee pots" in my vegetable garden. These fit at the end of the rows between my raised beds. 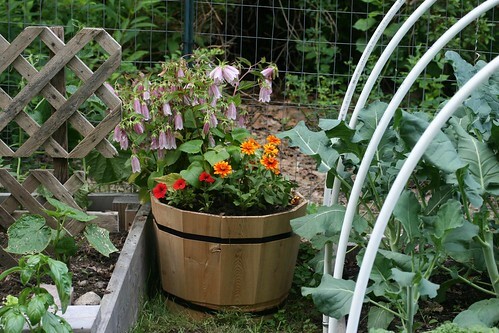 I want to attract my bees to my garden to pollinate the vegetables. So I selected flowers at the nursery that had honey bees on them. I enjoyed walking through the nursery and noticing how different flowers attract different bees. The honey bee pots I ended up with are not a mix of flowers I would have selected otherwise. Sort of an unusual combination. 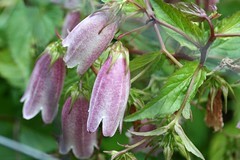 An amazing plant is Campanula takesimana "Elizabeth". It is both beautiful and was just covered with honey bees. I've never seen this plant before. I bought two of these. 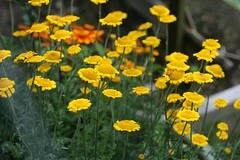 Also a large-flowered upright chamomile, a couple deep blue Veronicas, snapdragons and a small-flowered orange zinnia. I don't know why I was surprised, but the big draws in my garden are cosmos and sunflowers. When those bloom it's hard to sometimes find a flower that doesn't have a bee, or two, or five, on them. Am enjoying your blog! You make gardening look so simple and interesting. Keep it up! !